In the 1970s and 1980s, if someone referenced "The Wall" they were likely referring to the Berlin Wall (or the Pink Floyd album). Today, mention of "The Wall" likely refers to the Western Wall (the Kotel) in Jerusalem. While walls of the security variety have been much discussed lately -- from Israel's security fence to the billion dollar one Donald Trump wants to erect in America to keep out Mexicans -- the Kotel's gender divisions have been a divisive issue for the Jewish people for a very long time. An article on the Jerusalem Post website recently ran the headline: "Netanyahu agrees with haredim not to allow Women of the Wall to read Torah at Western Wall." That decision by the Prime Minister of Israel might be chalked up to the status quo and considered not very newsworthy as 2015 comes to a close, however, it is contradictory to his previous promise. As Women of the Wall officially noted, “Apparently when Netanyahu spoke of ‘all’ Jews in November 2015, he forgot that women make up half of all Jews." The group was referencing Netanyahu's statement at the Jewish Federations of North America General Assembly last month. In response to this negated promise, I don't think any Jews will offer up the rallying cry of "Mr. Netanyahu: Tear down that wall," but the ongoing unfairness at the Kotel is sure to leave many non-Orthodox Jews feeling that the Kotel no longer represents a religious or spiritual place for us. On my first visit to the Kotel I felt enormously spiritual while touching the ancient walls and offering a personal prayer for my dying grandfather. That was over 21 years ago, and I've returned to Israel many times since then. With each successive visit to the Kotel, I feel less and less connected to this ancient destination. This decline of spirituality and connection at the Kotel has been triggered specifically by the treatment of women at this holy site, but more generally by the way the Israeli government has allowed the Kotel to be controlled by the haredi Orthodox Jews. Non-haredi Jews feel marginalized at the Kotel and have been made to feel like strangers there -- or at the very least like guests in an ultra-Orthodox synagogue. The Kotel should be a holy site to all the Jewish people. In 2010, Rabbi Shmuel Rabinowitz, the administrator of the Western Wall and the Holy Places, officially banned anyone from bringing a private Torah scroll to the Western Wall plaza. This proclamation was approved by the Israeli Justice Ministry and means that Women of the Wall, or any other women's prayer group, would not have any access to a Torah scroll at the Kotel because Rabbi Rabinowitz also refuses to allow Women of the Wall to use one of the dozens of Torah scrolls in the men’s section. Women of the Wall stated, "No Israeli prime minister has the right to take away Torah from half of all Jews. It is our hope that Netanyahu will not ban women from reading Torah. 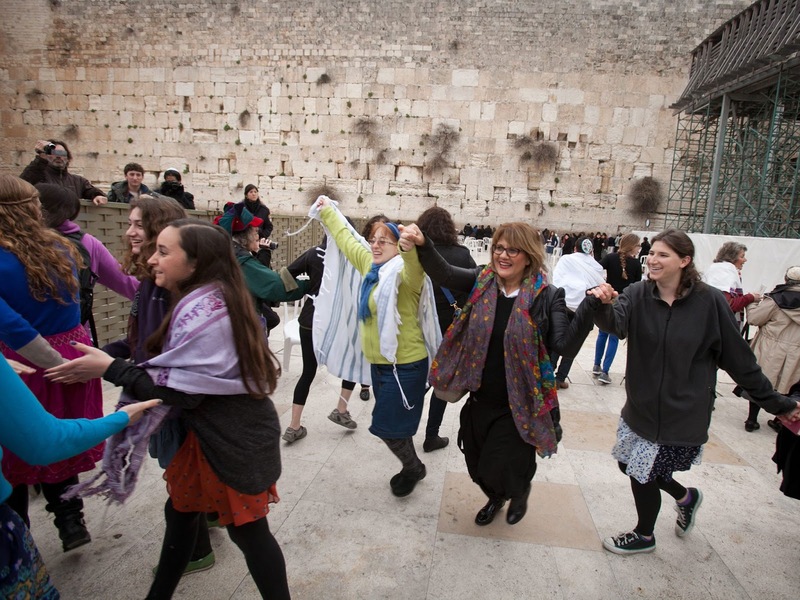 However, if he does bend to the pressure of the haredi parties, Women of the Wall will continue to read Torah in the women’s section of the Kotel. Even if we must hide our Torah scroll and smuggle it past the guards, we will do so just as Jews have been forced to do so many times before us in exile." I haven't always felt strongly about the unfair treatment of women at the Kotel. It was in February 2013 that I saw firsthand how the Women of the Wall were treated by the haredi establishment -- supported by the Israeli government and its police force -- at the Kotel. I joined several of my Conservative rabbinic colleagues for a morning Rosh Chodesh service at the Kotel. With several male rabbis, I watched over the dividing mechitza from the men's section of the Kotel as haredi men screamed and cursed at the women. Israeli police men (and women) patrolled the women's section. At first I thought this was to ensure their safety, as angry protesters have thrown chairs at them in the past, but as I watched I could tell that one of the police officers was warning some of the women wearing tallitot (prayer shawls). One female police officer videotaped the entire service, likely to prove that it was handled accordingly. A young man who works at the Kotel began moving shtenders (lecterns) and tables to separate us men from the rest of the men's section, in effect creating three prayer areas. Before the service concluded I saw some people begin to exit toward the plaza behind the women's section. I headed over there and saw two of the Israeli paratroopers who were in that iconic photograph at the newly reclaimed Kotel in 1967 after the Six-Day War. The men were being interviewed by Israeli media and talking openly about how they liberated the Old City of Jerusalem so that all people would be free to pray there, not only the ultra-Orthodox. It was remarkable to see these paratroopers at the Kotel after seeing that powerful photo since I was a young boy. The Kotel immediately came to take on a whole new meaning for me. And a moment later I developed a much stronger connection to the plight of the Women at the Wall. As I began to leave the Kotel plaza, two of my female colleagues were being escorted away by a police officer. Their passports were taken and they were detained for many hours at the Jerusalem police station. What was their crime? They were simply praying at a religious site that should afford the same access to them as it does to male Jews. Netanyahu has been Prime Minister for many years and no doubt, like all heads of state, wishes to leave a positive legacy after his time in office concludes. He made the Jewish people a promise last month at the JFNA's GA. He proclaimed in no uncertain terms that the Kotel belongs to all Jews. He has the moral responsibility to follow through on that promise and ensure an end to the discrimination against women at one of the Jewish people's holiest sites.